These photos are not for the sqeamish, so scroll past this post, if you'd like to see QUILTS! Ken has documented several of my surgeries for joint issues over the past 5 years, so this is nothing new. 1st photo: BEFORE; 2nd photo: 36 staples and one 12-inch incision. Looked a little like a bad horror movie. 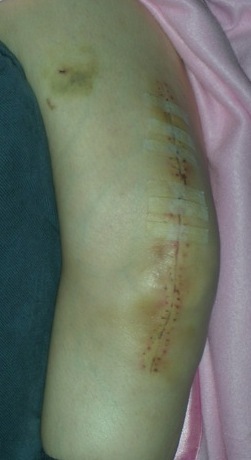 3rd photo: resting after icing the knee, staples out and a few steri-strips still in place. 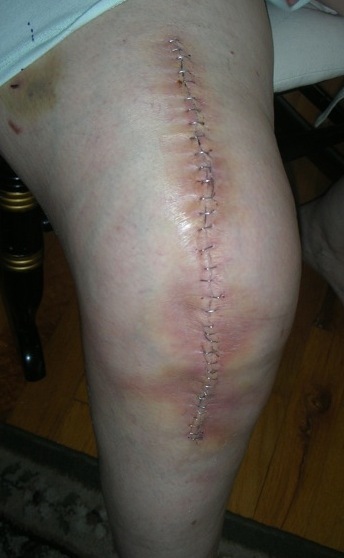 I'm two weeks out from total knee replacement, and I'm told I've made good progress with recovery: Staples came out on Monday, but I still have a few steri-strips to hold a few places together. PT yesterday went well. I can bend to 100°, and straighten the knee sitting without assistance to 15°and 10° lying flat. Not quite straight, but very close. I've transitioned from walker to cane, and this morning when I overslept, I found myself sans cane halfway between the bathroom and bedroom because I simply forgot that I needed it. I made it there and back on my own steam. The pain is different from before: weight bearing does not hurt, but movement does. The pain is still enough to keep me awake at night, but I'm managing without pain meds. I am getting through my days pretty well with lots of little naps between spurts of activity. Ken is getting lots of life lessons in household management while I am down. This morning, it was litter pan duty. The cats had been waiting, and waiting for someone to get them clean litter. Ken let Sally and Gianni outside while he was taking care of business. Sally slipped in when he went to get a fresh liner, and she immediately went to THE corner, and found the clean newspaper Ken keeps under the pan for near misses. She took this opportunity to make the first deposit before Ken had a chance to get the fresh pan in place. Laundry gets washed and dried, but who knew that folding and putting laundry away is not a matter of life and death? I actually survived Physical Therapy this morning with wad wrinkles all over my fresh, clean tee shirt. The refrigerator? Leftovers from before-new knee were still taking up space as of yesterday, and I finally convinced Ken they were no longer safe to serve. Two large bags of trash finally made it to the alley dumpster, and I actually still have a few flowers clinging to life in the front gardens. I think I will need to begin transitioning back to my real life real soon! Quilts are due at the publisher's for photography at the end of next week, so Ken is busy looking for really sturdy shipping boxes; at least 10 of them. I still need to re-write some of the patterns that I changed in construction, and run them by my tech editor. 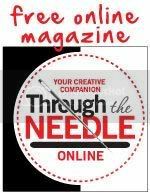 The month of August will be spent preparing and photographing about 100+ how-to photos for the lesson part of the book. And I want desparately to start thinking about and sewing things for our new grandson's nursery. (Due date: September 25.) Kerry interviewed for and was offered a position with Solae, a really interesting soy product company. He has been offered a position in their Memphis production plant. The young family will be relocating from Ames, IA shortly after the baby arrives. So there are a lot of things to occupy my mind and make a quick and full recovery imperative. Thanks so much for all your good wishes, prayers and positive thoughts. I so missed not being able to teach at the AQS Knoxville show last week, and I am missing Quilt Nebraska this weekend. 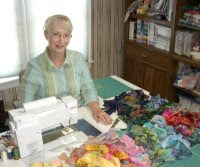 I love teaching in Nebraska venues, quilters there are so talented and friendly. Here's hoping I will be invited again when my body is fully functioning. I have never cancelled out on events before, and it was especially hard since I was so looking forward to them, but life sometimes gets in the way. Oh my - not so pretty but it's coming along, and good that you managed without your cane, even if by forgetfulness! Glad DH is keeping you alive, fed, clean, etc. I'm afraid my skinny man would let me starve! I will be at Quilt Nebraska this weekend, if only for one day. Did NOT sign up for classes as I just have too much going on - gotta get back to painting my house. Elaine, tell everyone at Quilt Nebraska Hello from me. My classes were filled, and I so hated to withdraw at the last minute, but there was an opening for surgery, and I knew I couldn't be comfortable on my feet for the weekend. I've had such pain since arthroscopy in February and it got worse with each engagement. I knew it was necessary and the sooner the better. So hoping Fay will ask me to come again in the near future. Have fun! Thank you for your concern for my knee surgery. I'm glad to see that your knee is getting better, slowly, and your that your husband is helping the best he can. With my knee, my doctor had gone in and repaired a tear and cleaned up all the debris from the grinding, and there is some bone exposed. He told my husband that I'm not a good candidate for knee replacement because of my age and activity. I have an appointment with him next week and I'll be able to talk to him face-to-face and ask him what my other options are. Jane, my knee was bone-on-bone in every compartment and I am NOT young. Because the knee replacements only last about 15-20 years or less, if you are more active. If you had it replaced now, you'd probably be looking at more surgery to replace the replacement several times over your lifetime. I had a friend who was only 35 when she had both knees done, and she's had to have both knees replaced a second time already. For her, there was no choice. She had NO cartilage left at age 35. I hope to NEVER go through this again. It is major surgery! Hang in there, and good luck with your knee.